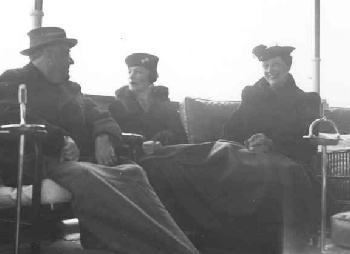 The film “Hyde Park on the Hudson” is primarily about FDR’s relationship with his distant cousin, Margaret “Daisy” Suckley (rhymes with Bookley). However the visiting British royals kind of stole the movie for me. While not central to the movie’s plot per se, considerable attention is given to their visit with a highlight of it being a picnic held in their honor where they are served “hot dogs” to eat. Neither the English King nor the Queen had ever eaten a “hot dog” and just between the two of them they are not sure if this is all on the level or perhaps to make fun of them. King George VI, however, decides to be a good sport and heartily eats the hot dogs he is given, and this incident became a symbol of England and the U.S. becoming stronger allies and better friends. Evidently much was made of this by the U.S. press. 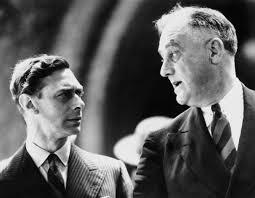 What is true is the visit leads to FDR and King George VI becoming fast friends and this friendship, in part, is reflected in the U.S. becoming a staunch supporter of England as WWII began to loom. Daisy Suckley, FDR’s close friend/distant cousin, also attended this same picnic held for the British King and Queen. Interestingly, in June 1989 there was a 50th anniversary reenactment of this picnic at the Roosevelt home on the Hudson known as Springwood and Daisy, now age 97, attended this event also. It turns out she and one other person were the only two remaining original picnic attendees that were still alive. Daisy was able to give some insight on the British royals and the hot dogs, and in her eyes it was not a big deal and all rather silly. Still, in honor of the occasion Miss Suckley, also a good sport, tasted a hot dog at the commemorative picnic.